Dr. Christy Anbe grew up 5 minutes from PetVet in Aiea. She enjoyed hiking at Aiea Loop trail and going to Pearlridge shopping center. Her love of animals started with “adopting” the neighborhood cats. Her favorite childhood cat was named Nancy. She remembers her greeting her every day and following her around the yard. She graduated from Punahou School. She enjoyed the traditions of Punahou carnival and the “Flaming P”. She then attended University of Hawaii at Manoa. She graduated with a bachelor degree in Animal Science. She loved driving out to the North shore to the UH farm. She had to buy some extra jackets when she went to veterinary school at Michigan State University. She was there when the Spartans won the 2000 NCAA basketball championship! After veterinary school she returned home with her adopted fur baby “Jazzman”. She immediately started working at Family Veterinary Clinic with Dr. Rod Pearson and Dr. Joy Yasuda. They enjoyed taking care of all the fur babies on the island, from doing wellness exams to late night emergencies. She stayed at “Family” for many more years after that. She enjoys doing a mixture of preventative medicine, internal medicine cases and general surgeries. She is happily married with 3 daughters. She is also quite busy with her fur babies too. She has 2 older poi dogs- Mochi, a border collie mix and Nala, a pitbull mix. Nala is her tripod baby, she was recused when she was a puppy and needed an amputation. She also has a “foster failure” tuxedo cat, named Mitty. When she fostered her, she didn’t want to get attachekad, so she called her “Kitty”. When she decided to become her forever family, she decided to call her “Mitty” since she answered to “kitty” already. She recently adopted a rescue silky terrier, Messi. He has added so much joy to her family. When she has family time, they enjoy going to the beach, hiking, and playing soccer at the park. When she has personal “free time” (which is rare), she enjoys doing yoga and watching movies. 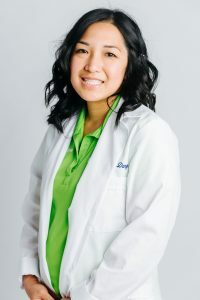 Dr. Kristin Dang was born and raised in Hawaii, and she grew up right here in the Salt Lake neighborhood. She graduated from Iolani School and then spent the next 8 years at Colorado State University earning a BS in microbiology and her Doctorate of Veterinary medicine in 2007. She completed a small animal rotating internship at the VCA 5th Avenue Veterinary Specialists hospital in Manhattan before returning home. 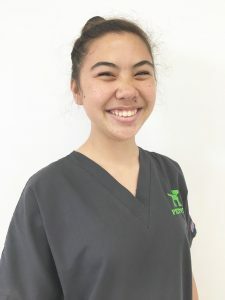 She started at VCA Kaneohe and then transferred closer to home at VCA Family Animal Hospital where she was able to gain valuable experience in general practice as well as emergency medicine for the next 10 years. She has also practiced at VCA Kapolei Animal Clinic. She enjoyed the smaller practice setting where she was able to give more personalized attention to her patients while still being able to provide the same high quality medicine and care. Dr. Dang has a special interest in canine reproduction and behavioral medicine. One of her favorite things about being a veterinarian is delivering puppies, but the most gratifying part of her work is helping people to understand their pets better and nurturing that bond into a lifelong relationship. In her younger years, Dr. Dang used to breed and show Pomeranians. Although she does miss the show ring, life has taken a different path. Nowadays she enjoys spending her time with her husband and 2 children, and their pets -Pomeranians Floyd and Carly, rescue Chihuahua mix Brody, and cat Cori. When life gives her a free moment, she enjoys movies, reading, cooking, traveling, dog shows, and all things Disney. 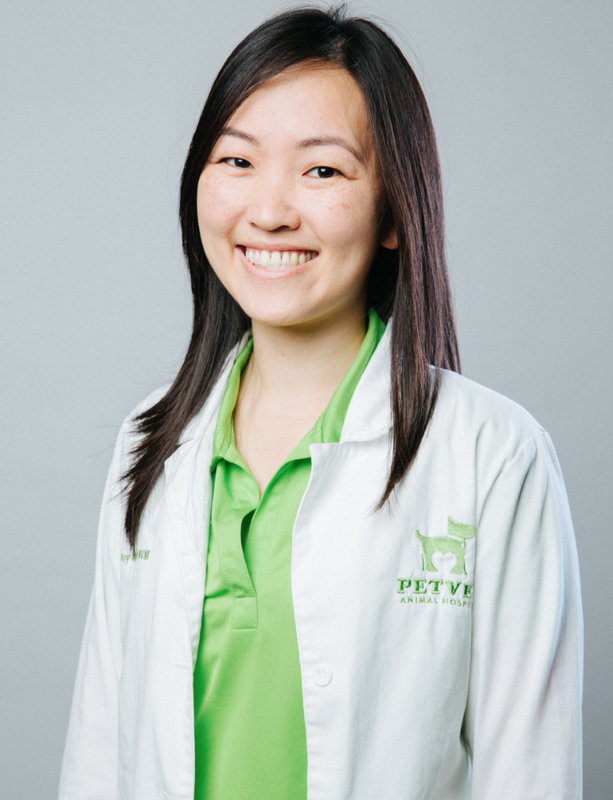 Dr. Dang is truly honored and excited to join the team at PetVet, and she looks forward to meeting you and your pets! Dr. Mari Kuboyama grew up in beautiful Manoa Valley. She was always surrounded by her family pets, and developed a soft spot for Golden Retrievers. After graduating from Mid-Pacific Institute, she attended the University of Hawaii at Manoa and received a Bachelor’s Degree in Biology. She continued on to the University of California, Davis where she received her Doctorate in Veterinary Medicine. She furthered her training by completing a rotating specialty/emergency internship at VCA San Francisco Veterinary Specialists. When not at the hospital, she enjoys hiking, cooking, and watching UH sports games. Rene’e Nagata grew up on the Big Island and knew she wanted to be a veterinarian since the age of 8. 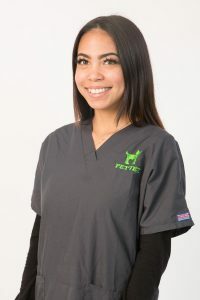 At an early age, Rene’e pursued her passion to become a veterinarian by volunteering at a local pet clinic and worked her way up from cleaning kennels, to veterinary assistant, to proud responsible pet parent. Rene’e continued her education at University of Hawaii and then at Iowa State University, where she received her Doctorate of Veterinary Medicine in 1994. Rene’e also completed a prestigious internship at California Animal Hospital, Ettinger Lusk and Feldman, where she learned medicine and ultrasound from the leading cardiologist and internist. 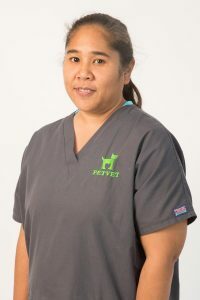 Rene’e has over 20 years of veterinary experience at Kaneohe Pet Health Center and VCA Kaneohe Animal Hospital. 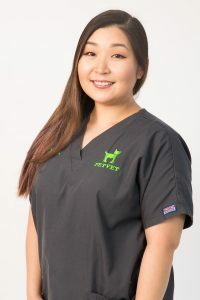 She loves practicing general medicine and is honored to be a part of PetVet Animal Hospital where she can further devote herself to the care of pets and people. Rene’e has two 2-legged children and two 4-legged children. Bobber is a cuddly Labrador/Pitbull rescue and Sally is a ferocious lizard hunter Maltese/King Charles Cavalier Spaniel. Rene’e enjoys spending time with her family, sewing, running and fishing in her spare time. 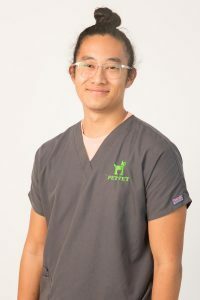 Dr. Jonathan Onaga started dreaming of becoming a veterinarian as a young kid when he was allowed to help the family veterinarian with examinations and shots for the family Golden Retriever named Katy. Jonathan is the oldest of three children and was born and raised in Mililani. After graduating from Punahou School, he earned a Bachelors Degree in Biology from the University of California, Irvine. 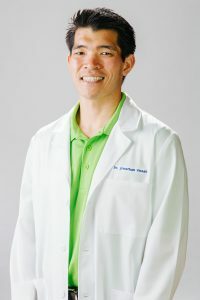 Jonathan returned home to pursue a Masters Degree in Animal Sciences from the University of Hawaii before attending veterinary school at Colorado State University. He enjoys spending his spare time fishing, diving, and playing sports with his friends. Dr. Melanie Pearson grew up in the veterinary world both around her father’s clinics (Dr. Rod Pearson) and with the ‘work’ he brought home with him. Youngest of four, she was born and raised in Kailua and graduated from Punahou School. She Pole Vaulted for Boston College while obtaining her Bachelor of Science in Biology, and went on to graduate from Ross University School of Veterinary Medicine. She spent her clinical year at Louisiana State University School of Veterinary Medicine. Dr. Pearson has practiced in central California as a general practitioner and in an Emergency Hospital in Prescott, Arizona before returning home. In her free time she enjoys taking her two chocolate labs Nestle and Twix hiking, and to the beach. Dr. Rod Pearson graduated from Colorado State University School of Veterinary Medicine. He built Kaneohe Veterinary Clinic, Kaneohe Pet Health Center, and Family Veterinary Clinic. After building these successful practices he retired, but retirement didn’t agree with him! He decided there was a need for a new hospital on Oahu and set to work on his plans. 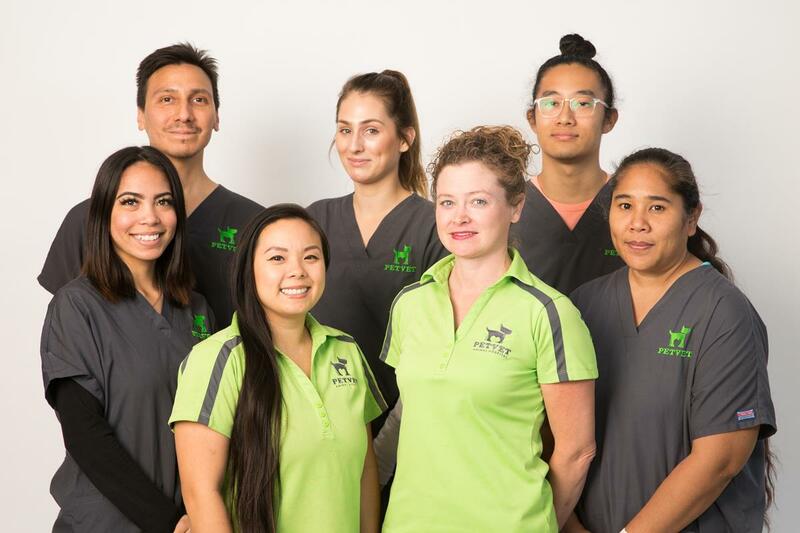 He worked with our other PetVet veterinarians at these previous hospitals, and is happy to bring together the most compassionate, bright, skilled veterinarians in our new PetVet Animal Hospital Ohana. He spends any free time with his wife Roslyn, grandkids, and his mixed breed dog Mobert whom he adopted from the Hawaiian Humane Society. 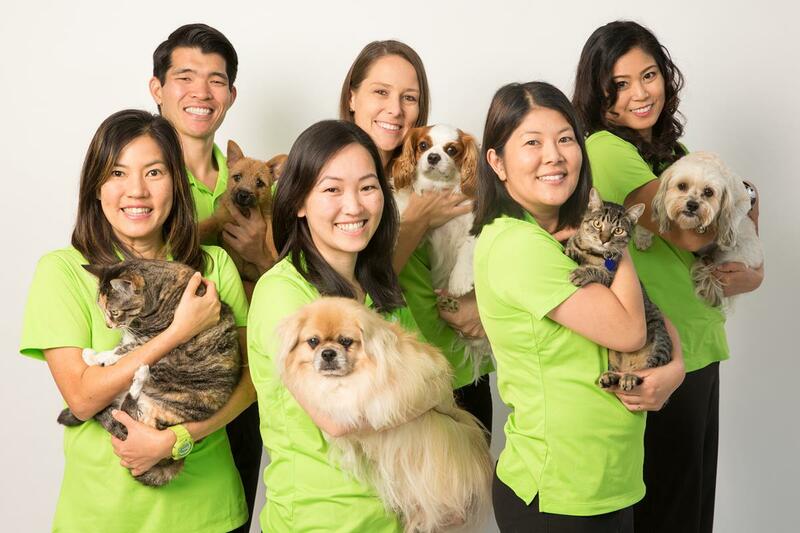 Dr. Joy Yasuda grew up in Aiea and attributes her early love of animals to her dad who got her first dog and allowed her to keep a pet pig in the family’s backyard. Dr. Joy graduated from Aiea High School and the University of Hawaii at Manoa with a degree in Animal Sciences. She then went on to Washington State School for her degree in Veterinary Medicine. While attending Wazzu, Dr. Joy completed a summer fellowship in veterinary pathology at the Johns Hopkins University Medical School in Baltimore, MD. Dr. Joy has been practicing veterinary medicine in Hawaii since 1999 and started at a small clinic in Waipio Gentry. 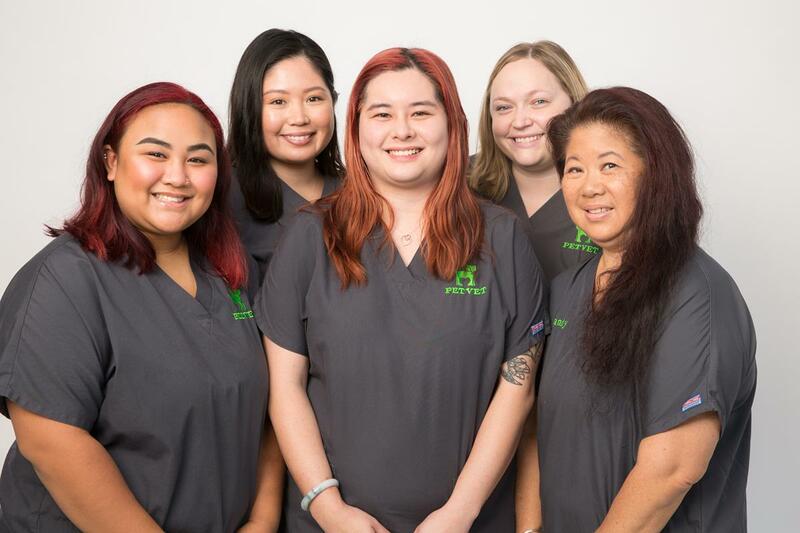 She then worked alongside Dr. Anbe and Dr. Rod Pearson for many years at Family Veterinary Clinic in Pearl City, which has grown into the now VCA Family and Specialty Animal Hospital. On her days off, Dr. Joy enjoys spending time with her husband and twins and she can be found watching their sporting events on the weekends. Umi, a rescue dog from the Humane Society, and Annie an adopted calico cat who was found in Waianae round out the members of Dr. Joy’s immediate family. And at the end of the day, with the little spare time she has, she enjoys watching “America’s Got Talent” on demand. Dr. Jenny Tarr is a native of Indiana. Ever since she was a small child, she had the goal of becoming a veterinarian. As a child she was drawn to the profession because of a love for animals and as an adult this attraction was strengthened because of a love for the people attached to those animals. Dr. Tarr graduated from Butler University with a Bachelor of Science in Biology and minors in Chemistry and Business Administration. She went on to attend Purdue University School of Veterinary Medicine and graduated in 2007. Dr. Tarr moved to Hawaii in 2008 and worked in both Kaneohe and Waipahu. In 2016 she decided to try something new and commissioned into the United States Army Veterinary Corps. She spent three years stationed on Naval Base Kitsap in Washington State providing veterinary care to military working dogs and participating in public health and food defense missions. The Army was a rewarding experience, but Dr. Tarr missed her friends and family in Hawaii too much to stay away. She is excited to be back in Hawaii and joining PetVet Animal Hospital. Dr. Tarr has special interests in emergency medicine, critical care, and surgery. In her spare time, she enjoys running, hiking, and watching Butler University Basketball in the company of her husband and cats (Boo and Rumple). Anela was born and raised an Oahu girl and lived in Aiea her whole life! This gal is a sun-loving, ball of fun! She is a recent graduate of Moanalua High School. Anela owns four loving dogs; Precious, Zion, and Kai who are Pitbulls, and Makana who is a poi dog. While she’s not at work, she is at home spending time with her family, boyfriend, and her fur babies. She shows her interest in being a makeup enthusiast, a food connoisseur, and an insane animal lover! Activities that she enjoys doing on her free time consist of binge watching random series & movies on Netflix, making Youtube videos with her boyfriend, lounging around and eating food, scrolling through social media, and hanging out with her biggest supporters. Anela gained the majority of her work experience in customer service, which influenced her love for helping others. That being mixed with her love for animals is what ignited the flame inside of her to work within the petcare services. 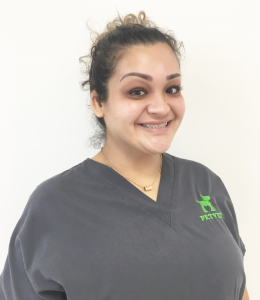 She looks forward to helping her fellow pet parents as well as their fur babies obtain the best care here at PetVet Animal Hospital! Jaz is a born and raised Hawaii local with a very short name that is easy to remember! 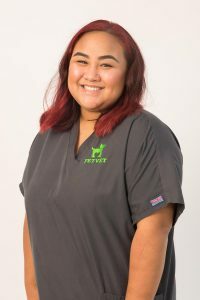 She has roughly 3 years of experience in pet care whether volunteering at the Hawaiian Humane Society or working in various positions in local clinics. She has a 6 month old miniature dachshund named Pie Boy, who is the love of her life. On her free time, she likes to watch funny videos on YouTube, shop at Target, or lounge around at home with Pie Boy and watch Bobs Burgers. She is excited to meet you and your fur baby at our wonderful PetVet! Joe-Lynn grew up on the island of Oahu in Hawaii and graduated from Moanalua High School. Joe-Lynn loves to spend time with her fiance and “bestest” friend Tanner, her mixed “poi” breed dog. 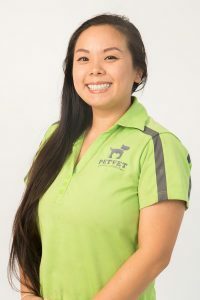 She has always loved working with animals and gained much of her “critter” experience while serving as an Adoptions Coordinator for the Oahu SPCA. 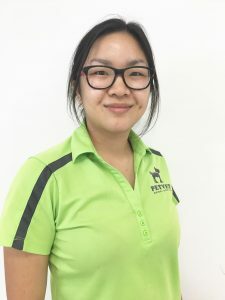 Her passion to help animals drove her desire to work at PetVet Animal Hospital where she eagerly aspires to gain more knowledge in helping animals. 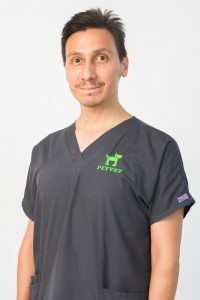 Joe-Lynn is the “Disney” of PetVet Animal Hospital and simply cannot wait to spoil your fur babies with treats, hugs and kisses (and not in that order)!! Kaitlin was born in Oregon but she has since lived in Hong Kong, the Netherlands, North Carolina, Washington, and now Hawaii. Although she has always had a love for animals, she originally pursued a career in human healthcare. 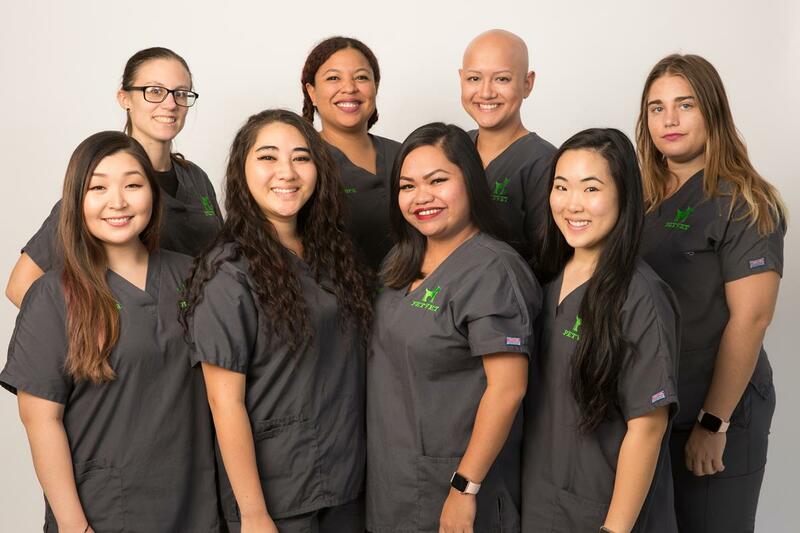 After four years of working in an OB/GYN office, where she worked as both a front desk coordinator and a clinical medical assistant, she decided it was time for a change. Working with animals was the perfect solution since it allows her to combine her love of animals with her passion for providing care and excellent customer service. In her free time, Kaitlin enjoys exploring and taking advantage of any opportunity to travel with her husband and their three children. She’s looking forwarding to welcoming you and your pet(s) to our PetVet ohana! 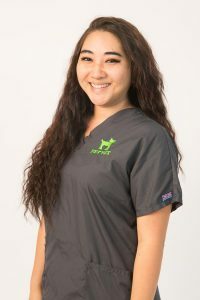 Dayna is a registered veterinary technician who was born and raised here in Honolulu. 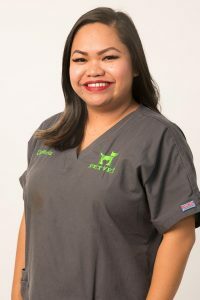 She attended Moanalua High School and is an honors graduate of the Veterinary Technology Program at Windward Community College. Dayna has grown up with her now geriatric, Lhasa apso-Keeshond dog, named Kia. Her interests include veterinary dentistry and nursing. In her free time, she enjoys reading, hiking, and going to concerts. Please ask her about how you can improve your pet’s oral health today! Jocelyn is a local girl from Wahiawa. She graduated from Bel-Rea Institute of Animal Technology with an AAS, and earned her certification as a veterinary technician shortly after. She is interested in emergency medicine and critical care. In her free time she enjoys the beach, free diving, playing with her dogs Scout a lab mix, and Clementine a Bernese mountain dog, and cuddling her cat Flick, a brown tabby. 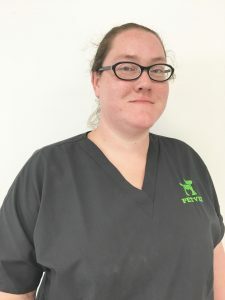 Jen comes from many years of experience in the veterinary field and recently joined our team, November of 2018. She is a registered veterinary technician from the state of California. She completed her certification from the Veterinary Technician Program at Modesto Junior College. Her interests include veterinary dentistry, low stress handling, and enjoys working with all species of animals. In her free time, she enjoys spending time with her husband and their fur babies. Jen is known for her calm, patient manner with both our patients and their owners. Carmela was born in the Philippines and raised in Waipahu. She graduated from Waipahu High School. She has a Border Collie named Basil. Her interests include socializing and learning about dogs. She spends her free time with her family and dogs. Haley-Kate was born and raised in Pearl City. She graduated from the University of Hawai’i at Manoa in the Spring of 2017 with a Bachelors in Animal Sciences. She has a small Chihuahua named Missy. Her interests include learning and caring for both small and exotic pets and is currently applying to veterinary school. In her free time she enjoys spending time with her family and playing games. 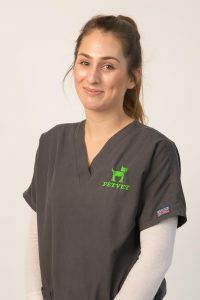 You are more than likely to see her face around PetVet as she is one of the technicians that can’t wait to welcome and help you and your pet during your visits! Kelly was born in Louisiana and raised in various parts of the United States and Germany. She has a boxer/English Springer Spaniel mix named Shadow and an orange cat named Mr. Garfield. Her interests include feline medicine and zoonotic disease prevention. In her free time she likes to go to the beach with her husband and daughter. Moani was born here on O’ahu and raised in Mililani. She graduated from Kamehameha Schools followed by getting her B.S. in Biology from Chaminade University. She has 6 years of experience in veterinary medicine, 3 of which were in the ICU. She enjoys terrible reality television, going to the gym, catching up on Youtube, the beach, and spending time with her black German Shepherd, Nala. She continues to have a passion for critical care & emergency medicine and can’t wait to shower your pet with proper intensive care and lots of TLC! Roman was born and raised in Texas. He recently moved to Oahu with his wife and their dog. The dog is a Chihuahua mix named Juantes. In his free time, Roman loves to spend time exploring the island with his wife and their dog. Elaine was born and raised in Honolulu. She graduated from Oregon State University in 2016 with a Bachelors in Animal Sciences. She has a Lhasa Apso named Shiro and a Pomeranian/chihuahua named Baby. Her interests include animal behavior and animal training. In her free time she enjoys traveling and spending time with her friends and family. Mikayla was born and raised here on Oahu and graduated from James Campbell High School. Since she was a little girl she always aspired to work with animals, but was given another opportunity where she earned her Associate’s degree in Applied Science. She then later worked at a pediatrician’s office as a medical assistant, and a front office administrative assistant. After 3 years of working in a pediatrician’s office she decided it was time to pursue her dreams of working with animals. In her free time she loves to spend time with her two kids, travel, and enjoying some good food. Traci was born and raised in Mililani. She graduated from Mililani High School followed by earning a B.A. in Biology from the University of Hawaii Manoa, and received her Pharm.D. at University of Hawaii Hilo Daniel K. Inouye College of Pharmacy. She gained several years of experience in veterinary medicine during high school and while obtaining her undergraduate degree. This pharmacist’s passion for animals is clear as she fulfills her pharmacist duties during the week, and spends her weekends here as a veterinary assistant. In her free time, she enjoys sleeping with her two chihuahua mixes, Miso and Bella, caring for her orchids and fish, and spending time with friends and family. Chris was raised in Makaha and Wahiawa. She graduated from Waianae High School and currently studies criminology at Argosy University. She has 2 adult children who share her love of animals. She has 4 rescue cats of various ages. Prior to owning cats, she rescued and rehabilitated wild birds, and had a great dane named Buster. With her 21+ years of experience in emergent, routine animal care and husbandry, she brings a wide variety of knowledge to the clinic setting. Cathy was born and raised in Disneyland aka Southern California. She graduated from the University of Hawaii at Manoa with a Bachelors in Animal Sciences. She recently adopted a dog named Moo from the Hawaiian Humane Society and hopes one day to have a family of farm animals and exotic pets in her backyard. Her interests include Marine Mammals (especially dolphins and killer whales), animal training, and animal care-taking. In her free time, she enjoys organizing and cleaning a messy house after her daughter’s play time, laying on the beach to even out tan lines, and watch movies with lots of buttered popcorn. She is super excited to meet and play with your kiddos at PetVet’s PetCare! Sara was born and raised in Kansas City, MO. She has lived in Rome, Italy, Rhode Island, New York and Santa Fe, NM, prior to finally settling down in Hawaii in 2005 when she and her husband moved to Kauai with their New Mexican Poi dog Aya Sophia. She has her BFA from Rhode Island School of Design, and her MFA from UH Manoa in Sculpture. 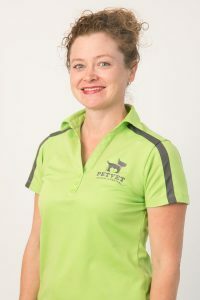 She brings 6 years of experience to PetVet in group play doggie daycare and boarding, as well lots of experience rehabilitating and fostering traumatized and at-risk dogs and cats into social happy furbabies. In her spare-time she loves trail running on Maunawili, Nuuanu-Pali, and Tantalus trails with her most recent rescue, a Greyhound/Whippet mix hunting dog from Kauai named Tashi. She is excited to meet you and your dog for a fun play day at PetVet! Jamie was born in Macon, Georgia. She attended Pierce College’s Veterinary Tech Program. In her free time she enjoys going to the beach and camping with her 4 year old son. She also has a dog named Munchie and 5 cats. Ashley was born and raised in the San Francisco Bay Area, before moving to Oahu in 2016, to be with family. A life-long animal lover, she has held many jobs in the animal care field and brings 7+ years of experience to PetVet, including animal rescue & rehabilitation, doggie daycare management, and K9 socialization. She is certified in Wildlife Conservation & Management, but is currently continuing her education in animal behavior and dog training. In her free time, Ashley loves to go to the beach and binge watch Netflix. Ashley also has two dogs at home; Mickey (a foster failure) and Haupia (a rescue pup), as well as an orange tabby cat, named Leo. Caitlin was born and raised here in Oahu, Hawaii! She mainly grew up in Kalihi and graduated from Farrington High School. She has three dogs; two from the Hawaiian Humane Society (a chihuahua named Munchkin and a lab terrier mix named Paisley), and one who came off the street and decided to adopt us (named Bruno)! Her hobbies are eating, make-up, and traveling. In her free time, she likes to sleep and eat. She’s excited to see you and your fur babies here at PetVet! Jordena was born in New Jersey, then later moved to Hawaii. She graduated from Castle High School and has been working with animals for more than 10 years. She started working at small pet stores, then later started working at animal hospitals. She has a 10 year old Siberian husky named Yuki. In her free time she spends it with family and friends. Makana was born and raised on Oahu. A former Kamehameha student, Makana volunteered his time at the Hawaiian Humane Society for senior service day which reignited a passion and interest in animals that he had as a child. 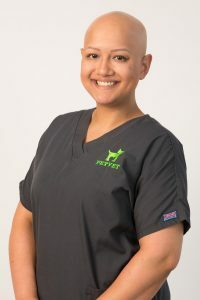 Makana brings 2+ years of experience in doggie daycare and K9 behavior to the PetVet team, and is pursuing more education in dog training and behavior. In his spare time, he likes to keep active and maintain a healthy lifestyle. Makana also has 2 rescue dogs and a cat at home. Amanda was born and raised in Honolulu, HI. She graduated from Moanalua High School and is attending Penn Foster college. Her interests include furthering her knowledge of pets and their behavior. In her free time, she enjoys meeting all types of animals, and adapting to their individual needs. She is super excited to meet and play with your ohana at PetVet’s PetCare!